Taking flight HY 528 from Tokyo at 19:00. Transfer to the hotel and accommodation. Rest after a long flight. Light snack in the hotel. Overnight in hotel. Transfer to Samarkand via Shakhrisabz - a unique monument of town-planning and architecture (270 km, 3,5 hrs). Shakhrisabz tour: ruins of "Ak-Saray Palace" - Tamerlan's summer residence that shocked the imagination of his contemporaries (14-15th c.), "Jahongir Mausoleum" - mausoleum of Tamerlan's eldest and favorite son (14th c.), complex "Dor-ut Saodat": "Khazratiy Imam Mosque" - the multi-stage mosque with domical hall with decorated ayvans (14th c.), "Gumbazi-Seiidan" - mausoleum of possible offspring of Temur, "Kok Gumbaz Mosque" ("Blue dome") - built by Ulugbek on behalf of his father Shahruh (15th c). The Golden Road to the historical town of Samarkand - a crossroad of the world's cultures, one of the most ancient cities in the world (90 km, 1,5 hrs). Hotel accommodation and free time. Overnight in the city that is a contemporary of ancient Rome and has a history of more than 2500-years. Breakfast. 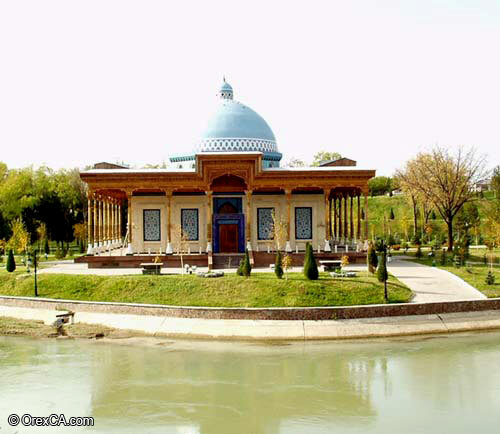 City tour: Gur Emir Mausoleum - Tamerlan's tomb (14-15th c.) that was built for Temur's grandson Muhammad-Sultan and tombs of three other Temurids - sons of Temur - Miranshah and Shahruh and his grandson Ulugbek, Ruhabad Mausoleum ("House of Spirit") - a legend says that under the dome there is a box with seven hairs of Prophet Muhammad (14th c.), Registan Square ("A sandy place") - the major square of Samarkand: "Ulugbeg Madrassah" - Sheikh Khodja Akhrar and poet Djami were among outstanding graduates of the Madrassah (15th c.), "Sher-Dor Madrassah" ("Having tigers") (17th c.), "Tillya-Kari Madrassah" ("Coated by gold") - the rich gilding on the dome, walls and mihrab surpassed all famous buildings in Central Asia (17th c). An architectural complex Shahi-Zinda ("Alive king") - necropolis on the slope of the Afrosiab hill is connected with Kusam ibn Abbas - the cousin of Prophet Muhammad (11-15th c.). 13-00 - Lunch in local cafe during excursion. 19-00 - Dinner outside the hotel. 06-00 - Breakfast. 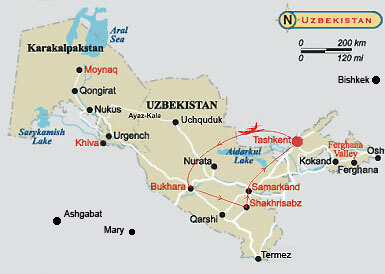 On the way to Tashkent (315 km, 5 hrs) you can visit the biggest observatory of the 15th c. built by Ulugbeg. Arrival to the capital of Uzbekistan. Lunch. 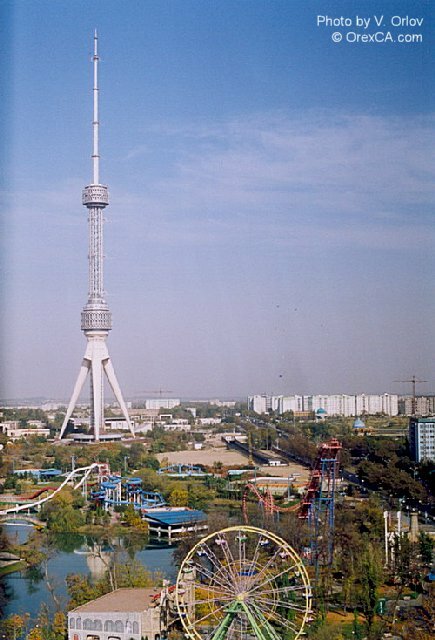 City tour around Tashkent: New Tashkent Television Tower - the highest in Central Asia - 375 m, Memorial to the Victims of Repression - the memorial complex and museum, Monument of Courage - the epicenter of Tashkent earthquake of 1966 (1976 y). Old part of the city: the architectural complex Khazret-Imam incl. necropolis of imam Abu Bakr Muhammad al-Kaffal Shashi who was one of the first Muslim imams and a famous divine and poet (16th c.), Barak-khan Madrassah - built by Suyunidj-khan - the first ruler of the Uzbek dynasty of the Sheibanid's (16th c.), Tellya Sheikh Madrassah also called "Khast Imom Mosque" where Osman Quran - the world's oldest is kept (19th c.), "Mui-Mubarak Madrassah (19th c.)", Imam Ismail al Bukhari Islamic Institute - a two year post-Madrassah academy, "Hadra" square, Kukeldash Madrassah ("Foster brother") - was built by Kukekdash - the vizier of Tashkent khans (16th c.), Jami Mosque (15-19th cc.) - the third biggest mosque in Uzbekistan, Chorsu - oriental bazaar, National park, Abdulkasim Madrassah which now is the centre for traditional arts with attractive souvenirs by local artisans (19th c.). 12-00 - Lunch in local cafe during excursion. 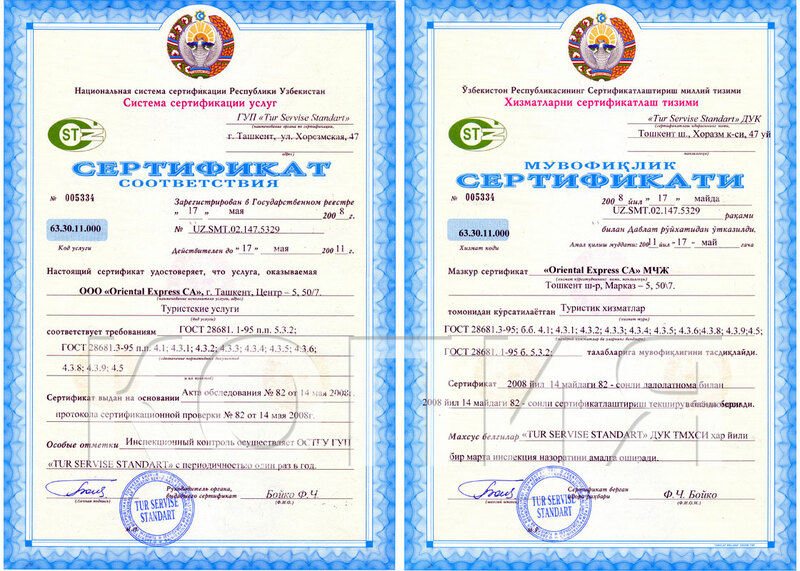 17-00 - Visiting Theatre of opera and balet named of A.Navoi. 19-00 - Farewell dinner in restaurant. 06-05 - Departure transfer and leave for Tokyo HY 527 at 07:00. Good bye to the wonderful land, back to monotony with the intention of returning.